"Medicines" redirects here. For other uses, see Medicine (disambiguation) and Medication (disambiguation). A medication (also referred to as medicine, pharmaceutical drug, or simply drug) is a drug used to diagnose, cure, treat, or prevent disease. Drug therapy (pharmacotherapy) is an important part of the medical field and relies on the science of pharmacology for continual advancement and on pharmacy for appropriate management. Drugs are classified in various ways. One of the key divisions is by level of control, which distinguishes prescription drugs (those that a pharmacist dispenses only on the order of a physician, physician assistant, or qualified nurse) from over-the-counter drugs (those that consumers can order for themselves). Another key distinction is between traditional small-molecule drugs, usually derived from chemical synthesis, and biopharmaceuticals, which include recombinant proteins, vaccines, blood products used therapeutically (such as IVIG), gene therapy, monoclonal antibodies and cell therapy (for instance, stem-cell therapies). Other ways to classify medicines are by mode of action, route of administration, biological system affected, or therapeutic effects. An elaborate and widely used classification system is the Anatomical Therapeutic Chemical Classification System (ATC system). The World Health Organization keeps a list of essential medicines. Drug discovery and drug development are complex and expensive endeavors undertaken by pharmaceutical companies, academic scientists, and governments. As a result of this complex path from discovery to commercialization, partnering has become a standard practice for advancing drug candidates through development pipelines. Governments generally regulate what drugs can be marketed, how drugs are marketed, and in some jurisdictions, drug pricing. Controversies have arisen over drug pricing and disposal of used drugs. A substance recognized by an official pharmacopoeia or formulary. A substance intended for use in the diagnosis, cure, mitigation, treatment, or prevention of disease. A substance (other than food) intended to affect the structure or any function of the body. A substance intended for use as a component of a medicine but not a device or a component, part or accessory of a device. Biological products are included within this definition and are generally covered by the same laws and regulations, but differences exist regarding their manufacturing processes (chemical process versus biological process). Drug use among elderly Americans has been studied; in a group of 2377 people with average age of 71 surveyed between 2005 and 2006, 84% took at least one prescription drug, 44% took at least one over-the-counter (OTC) drug, and 52% took at least one dietary supplement; in a group of 2245 elderly Americans (average age of 71) surveyed over the period 2010 – 2011, those percentages were 88%, 38%, and 64%. One of the key classifications is between traditional small molecule drugs; usually derived from chemical synthesis, and biologic medical products; which include recombinant proteins, vaccines, blood products used therapeutically (such as IVIG), gene therapy, and cell therapy (for instance, stem cell therapies). Pharmaceuticals or drugs or medicines are classified in various other groups besides their origin on the basis of pharmacological properties like mode of action and their pharmacological action or activity, such as by chemical properties, mode or route of administration, biological system affected, or therapeutic effects. An elaborate and widely used classification system is the Anatomical Therapeutic Chemical Classification System (ATC system). The World Health Organization keeps a list of essential medicines. Pharmaceuticals may also be described as "specialty", independent of other classifications, which is an ill-defined class of drugs that might be difficult to administer, require special handling during administration, require patient monitoring during and immediately after administration, have particular regulatory requirements restricting their use, and are generally expensive relative to other drugs. General: β-receptor blockers ("beta blockers"), calcium channel blockers, diuretics, cardiac glycosides, antiarrhythmics, nitrate, antianginals, vasoconstrictors, vasodilators. HMG-CoA reductase inhibitors (statins) for lowering LDL cholesterol inhibitors: hypolipidaemic agents. Drugs affecting the central nervous system include: Psychedelics, hypnotics, anaesthetics, antipsychotics, eugeroics, antidepressants (including tricyclic antidepressants, monoamine oxidase inhibitors, lithium salts, and selective serotonin reuptake inhibitors (SSRIs)), antiemetics, Anticonvulsants/antiepileptics, anxiolytics, barbiturates, movement disorder (e.g., Parkinson's disease) drugs, stimulants (including amphetamines), benzodiazepines, cyclopyrrolones, dopamine antagonists, antihistamines, cholinergics, anticholinergics, emetics, cannabinoids, and 5-HT (serotonin) antagonists. The main classes of painkillers are NSAIDs, opioids and Local anesthetics. Some anesthetics include Benzodiazepines and Barbiturates. The main categories of drugs for musculoskeletal disorders are: NSAIDs (including COX-2 selective inhibitors), muscle relaxants, neuromuscular drugs, and anticholinesterases. antibiotics, antifungals, antileprotics, antituberculous drugs, antimalarials, anthelmintics, amoebicides, antivirals, antiprotozoals, probiotics, prebiotics, antitoxins and antivenoms. A euthanaticum is used for euthanasia and physician-assisted suicide. Euthanasia is not permitted by law in many countries, and consequently medicines will not be licensed for this use in those countries. Administration is the process by which a patient takes a medicine. There are three major categories of drug administration; enteral (by mouth), parenteral (into the blood stream), and other (which includes giving a drug through intranasal, topical, inhalation, and rectal means). It can be performed in various dosage forms such as pills, tablets, or capsules. The drug may contain a single or multiple active ingredients. There are many variations in the routes of administration, including intravenous (into the blood through a vein) and oral administration (through the mouth). They can be administered all at once as a bolus, at frequent intervals or continuously. Frequencies are often abbreviated from Latin, such as every 8 hours reading Q8H from Quaque VIII Hora. In the fields of medicine, biotechnology and pharmacology, drug discovery is the process by which new drugs are discovered. Historically, drugs were discovered through identifying the active ingredient from traditional remedies or by serendipitous discovery. Later chemical libraries of synthetic small molecules, natural products or extracts were screened in intact cells or whole organisms to identify substances that have a desirable therapeutic effect in a process known as classical pharmacology. Since sequencing of the human genome which allowed rapid cloning and synthesis of large quantities of purified proteins, it has become common practice to use high throughput screening of large compounds libraries against isolated biological targets which are hypothesized to be disease modifying in a process known as reverse pharmacology. Hits from these screens are then tested in cells and then in animals for efficacy. Even more recently, scientists have been able to understand the shape of biological molecules at the atomic level, and to use that knowledge to design (see drug design) drug candidates. Modern drug discovery involves the identification of screening hits, medicinal chemistry and optimization of those hits to increase the affinity, selectivity (to reduce the potential of side effects), efficacy/potency, metabolic stability (to increase the half-life), and oral bioavailability. Once a compound that fulfills all of these requirements has been identified, it will begin the process of drug development prior to clinical trials. One or more of these steps may, but not necessarily, involve computer-aided drug design. Despite advances in technology and understanding of biological systems, drug discovery is still a lengthy, "expensive, difficult, and inefficient process" with low rate of new therapeutic discovery. In 2010, the research and development cost of each new molecular entity (NME) was approximately US$1.8 billion. Drug discovery is done by pharmaceutical companies, with research assistance from universities. The "final product" of drug discovery is a patent on the potential drug. The drug requires very expensive Phase I, II and III clinical trials, and most of them fail. Small companies have a critical role, often then selling the rights to larger companies that have the resources to run the clinical trials. Drug development is the process of bringing a new drug to the market once a lead compound has been identified through the process of drug discovery. It includes pre-clinical research (microorganisms/animals) and clinical trials (on humans) and may include the step of obtaining regulatory approval to market the drug. The regulation of drugs varies by jurisdiction. In some countries, such as the United States, they are regulated at the national level by a single agency. In other jurisdictions they are regulated at the state level, or at both state and national levels by various bodies, as is the case in Australia. The role of therapeutic goods regulation is designed mainly to protect the health and safety of the population. Regulation is aimed at ensuring the safety, quality, and efficacy of the therapeutic goods which are covered under the scope of the regulation. In most jurisdictions, therapeutic goods must be registered before they are allowed to be marketed. There is usually some degree of restriction of the availability of certain therapeutic goods depending on their risk to consumers. Depending upon the jurisdiction, drugs may be divided into over-the-counter drugs (OTC) which may be available without special restrictions, and prescription drugs, which must be prescribed by a licensed medical practitioner in accordance with medical guidelines due to the risk of adverse effects and contraindications. The precise distinction between OTC and prescription depends on the legal jurisdiction. A third category, "behind-the-counter" drugs, is implemented in some jurisdictions. These do not require a prescription, but must be kept in the dispensary, not visible to the public, and only be sold by a pharmacist or pharmacy technician. Doctors may also prescribe prescription drugs for off-label use – purposes which the drugs were not originally approved for by the regulatory agency. The Classification of Pharmaco-Therapeutic Referrals helps guide the referral process between pharmacists and doctors. The International Narcotics Control Board of the United Nations imposes a world law of prohibition of certain drugs. They publish a lengthy list of chemicals and plants whose trade and consumption (where applicable) is forbidden. OTC drugs are sold without restriction as they are considered safe enough that most people will not hurt themselves accidentally by taking it as instructed. Many countries, such as the United Kingdom have a third category of "pharmacy medicines", which can only be sold in registered pharmacies by or under the supervision of a pharmacist. Medical errors include overprescription and polypharmacy, misprescription, contraindication and lack of detail in dosage and administrations instructions. In 2000 the definition of a prescription error was studied using a Delphi method conference; the conference was motivated by ambiguity in the what a prescription error and a need to use a uniform definition in studies. In many jurisdictions drug prices are regulated. In the UK, the Pharmaceutical Price Regulation Scheme is intended to ensure that the National Health Service is able to purchase drugs at reasonable prices. The prices are negotiated between the Department of Health, acting with the authority of Northern Ireland and the UK Government, and the representatives of the Pharmaceutical industry brands, the Association of the British Pharmaceutical Industry (ABPI). For 2017 this payment percentage set by the PPRS will be 4,75%. In Brazil, the prices are regulated through a legislation under the name of Medicamento Genérico (generic drugs) since 1999. In India, drug prices are regulated by the National Pharmaceutical Pricing Authority. In the United States, drug costs are unregulated, but instead are the result of negotiations between drug companies and insurance companies. High prices have been attributed to monopolies given to manufacturers by the government and a lack of ability for organizations to negotiate prices. A blockbuster drug is a drug generating more than $1 billion of revenue for the pharmaceutical company that sells it each year. Cimetidine was the first drug ever to reach more than $1 billion a year in sales, thus making it the first blockbuster drug. "In the pharmaceutical industry, a blockbuster drug is one that achieves acceptance by prescribing physicians as a therapeutic standard for, most commonly, a highly prevalent chronic (rather than acute) condition. Patients often take the medicines for long periods." Interestingly, despite the enormous advances in science and technology, the number of new blockbuster drugs has halved roughly every 9 years since 1950. This was ascribed to the fact that every new drug competes in effectiveness with every other drugs known so far, other economic factors and ever-tightening regulations. Antibiotics first arrived on the medical scene in 1932 thanks to Gerhard Domagk; and were coined the "wonder drugs". The introduction of the sulfa drugs led to the mortality rate from pneumonia in the U.S. to drop from 0.2% each year to 0.05% by 1939. Antibiotics inhibit the growth or the metabolic activities of bacteria and other microorganisms by a chemical substance of microbial origin. Penicillin, introduced a few years later, provided a broader spectrum of activity compared to sulfa drugs and reduced side effects. Streptomycin, found in 1942, proved to be the first drug effective against the cause of tuberculosis and also came to be the best known of a long series of important antibiotics. A second generation of antibiotics was introduced in the 1940s: aureomycin and chloramphenicol. Aureomycin was the best known of the second generation. Lithium was discovered in the 19th century for nervous disorders and its possible mood-stabilizing or prophylactic effect; it was cheap and easily produced. As lithium fell out of favor in France, valpromide came into play. This antibiotic was the origin of the drug that eventually created the mood stabilizer category. Valpromide had distinct psychotrophic effects that were of benefit in both the treatment of acute manic states and in the maintenance treatment of manic depression illness. Psychotropics can either be sedative or stimulant; sedatives aim at damping down the extremes of behavior. Stimulants aim at restoring normality by increasing tone. Soon arose the notion of a tranquilizer which was quite different from any sedative or stimulant. The term tranquilizer took over the notions of sedatives and became the dominant term in the West through the 1980s. In Japan, during this time, the term tranquilizer produced the notion of a psyche-stabilizer and the term mood stabilizer vanished. Premarin (conjugated estrogens, introduced in 1942) and Prempro (a combination estrogen-progestin pill, introduced in 1995) dominated the hormone replacement therapy (HRT) during the 1990s. HRT is not a life-saving drug, nor does it cure any disease. HRT has been prescribed to improve one's quality of life. Doctors prescribe estrogen for their older female patients both to treat short-term menopausal symptoms and to prevent long-term diseases. In the 1960s and early 1970s, more and more physicians began to prescribe estrogen for their female patients. between 1991 and 1999, Premarin was listed as the most popular prescription and best-selling drug in America. The first oral contraceptive, Enovid, was approved by FDA in 1960. Oral contraceptives inhibit ovulation and so prevent conception. Enovid was known to be much more effective than alternatives including the condom and the diaphragm. As early as 1960, oral contraceptives were available in several different strengths by every manufacturer. In the 1980s and 1990s, an increasing number of options arose including, most recently, a new delivery system for the oral contraceptive via a transdermal patch. In 1982, a new version of the Pill was introduced, known as the "biphasic" pill. By 1985, a new triphasic pill was approved. Physicians began to think of the Pill as an excellent means of birth control for young women. Stimulants such as Ritalin (methylphenidate) came to be pervasive tools for behavior management and modification in young children. 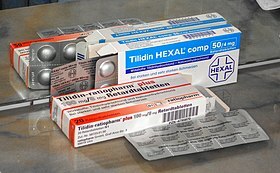 Ritalin was first marketed in 1955 for narcolepsy; its potential users were middle-aged and the elderly. It wasn't until some time in the 1980s along with hyperactivity in children that Ritalin came onto the market. Medical use of methlyphenidate is predominately for symptoms of attention deficit/hyperactivity disorder (ADHD). Consumption of methylphenidate in the U.S. out-paced all other countries between 1991 and 1999. Significant growth in consumption was also evident in Canada, New Zealand, Australia, and Norway. Currently, 85% of the world's methylphanidate is consumed in America. The first minor tranquilizer was Meprobamate. Only fourteen months after it was made available, meprobamate had become the country's largest-selling prescription drug. By 1957, meprobamate had become the fastest-growing drug in history. The popularity of meprobamate paved the way for Librium and Valium, two minor tranquilizers that belonged to a new chemical class of drugs called the benzodiazepines. These were drugs that worked chiefly as anti-anxiety agents and muscle relaxants. The first benzodiazepine was Librium. Three months after it was approved, Librium had become the most prescribed tranquilizer in the nation. Three years later, Valium hit the shelves and was ten times more effective as a muscle relaxant and anti-convulsant. Valium was the most versatile of the minor tranquilizers. Later came the widespread adoption of major tranquilizers such as chlorpromazine and the drug reserpine. In 1970, sales began to decline for Valium and Librium, but sales of new and improved tranquilizers, such as Xanax, introduced in 1981 for the newly created diagnosis of panic disorder, soared. Mevacor (lovastatin) is the first and most influential statin in the American market. The 1991 launch of Pravachol (pravastatin), the second available in the United States, and the release of Zocor (simvastatin) made Mevacor no longer the only statin on the market. In 1998, Viagra was released as a treatment for erectile dysfunction. Using plants and plant substances to treat all kinds of diseases and medical conditions is believed to date back to prehistoric medicine. The Kahun Gynaecological Papyrus, the oldest known medical text of any kind, dates to about 1800 BC and represents the first documented use of any kind of drug. It and other medical papyri describe Ancient Egyptian medical practices, such as using honey to treat infections and the legs of bee-eaters to treat neck pains. Ancient Babylonian medicine demonstrate the use of prescriptions in the first half of the 2nd millennium BC. Medicinal creams and pills were employed as treatments. On the Indian subcontinent, the Atharvaveda, a sacred text of Hinduism whose core dates from the 2nd millennium BC, although the hymns recorded in it are believed to be older, is the first Indic text dealing with medicine. It describes plant-based drugs to counter diseases. The earliest foundations of ayurveda were built on a synthesis of selected ancient herbal practices, together with a massive addition of theoretical conceptualizations, new nosologies and new therapies dating from about 400 BC onwards. The student of Āyurveda was expected to know ten arts that were indispensable in the preparation and application of his medicines: distillation, operative skills, cooking, horticulture, metallurgy, sugar manufacture, pharmacy, analysis and separation of minerals, compounding of metals, and preparation of alkalis. The Hippocratic Oath for physicians, attributed to 5th century BC Greece, refers to the existence of "deadly drugs", and ancient Greek physicians imported drugs from Egypt and elsewhere. Al-Kindi's 9th century AD book, De Gradibus and Ibn Sina (Avicenna)'s The Canon of Medicine cover a range of drugs known to Medicine in the medieval Islamic world. Medieval medicine saw advances in surgery, but few truly effective drugs existed, beyond opium (found in such extremely popular drugs as the "Great Rest" of the Antidotarium Nicolai at the time) and quinine. Folklore cures and potentially poisonous metal-based compounds were popular treatments. Theodoric Borgognoni, (1205–1296), one of the most significant surgeons of the medieval period, responsible for introducing and promoting important surgical advances including basic antiseptic practice and the use of anaesthetics. Garcia de Orta described some herbal treatments that were used. During the First World War, Alexis Carrel and Henry Dakin developed the Carrel-Dakin method of treating wounds with an irrigation, Dakin's solution, a germicide which helped prevent gangrene. In the inter-war period, the first anti-bacterial agents such as the sulpha antibiotics were developed. The Second World War saw the introduction of widespread and effective antimicrobial therapy with the development and mass production of penicillin antibiotics, made possible by the pressures of the war and the collaboration of British scientists with the American pharmaceutical industry. Medicines commonly used by the late 1920s included aspirin, codeine, and morphine for pain; digitalis, nitroglycerin, and quinine for heart disorders, and insulin for diabetes. Other drugs included antitoxins, a few biological vaccines, and a few synthetic drugs. In the 1930s, antibiotics emerged: first sulfa drugs, then penicillin and other antibiotics. Drugs increasingly became "the center of medical practice". :22 In the 1950s, other drugs emerged including corticosteroids for inflammation, rauvolfia alkaloids as tranqulizers and antihypertensives, antihistamines for nasal allergies, xanthines for asthma, and typical antipsychotics for psychosis. :23–24 As of 2007, thousands of approved drugs have been developed. Increasingly, biotechnology is used to discover biopharmaceuticals. Recently, multi-disciplinary approaches have yielded a wealth of new data on the development of novel antibiotics and antibacterials and on the use of biological agents for antibacterial therapy. In the 1950s, new psychiatric drugs, notably the antipsychotic chlorpromazine, were designed in laboratories and slowly came into preferred use. Although often accepted as an advance in some ways, there was some opposition, due to serious adverse effects such as tardive dyskinesia. Patients often opposed psychiatry and refused or stopped taking the drugs when not subject to psychiatric control. Controversies concerning pharmaceutical drugs include patient access to drugs under development and not yet approved, pricing, and environmental issues. Governments worldwide have created provisions for granting access to drugs prior to approval for patients who have exhausted all alternative treatment options and do not match clinical trial entry criteria. Often grouped under the labels of compassionate use, expanded access, or named patient supply, these programs are governed by rules which vary by country defining access criteria, data collection, promotion, and control of drug distribution. Within the United States, pre-approval demand is generally met through treatment IND (investigational new drug) applications (INDs), or single-patient INDs. These mechanisms, which fall under the label of expanded access programs, provide access to drugs for groups of patients or individuals residing in the US. Outside the US, Named Patient Programs provide controlled, pre-approval access to drugs in response to requests by physicians on behalf of specific, or "named", patients before those medicines are licensed in the patient's home country. Through these programs, patients are able to access drugs in late-stage clinical trials or approved in other countries for a genuine, unmet medical need, before those drugs have been licensed in the patient's home country. Patients who have not been able to get access to drugs in development have organized and advocated for greater access. In the United States, ACT UP formed in the 1980s, and eventually formed its Treatment Action Group in part to pressure the US government to put more resources into discovering treatments for AIDS and then to speed release of drugs that were under development. The Abigail Alliance was established in November 2001 by Frank Burroughs in memory of his daughter, Abigail. The Alliance seeks broader availability of investigational drugs on behalf of terminally ill patients. In 2013, BioMarin Pharmaceutical was at the center of a high-profile debate regarding expanded access of cancer patients to experimental drugs. Essential medicines as defined by the World Health Organization (WHO) are "those drugs that satisfy the health care needs of the majority of the population; they should therefore be available at all times in adequate amounts and in appropriate dosage forms, at a price the community can afford." Recent studies have found that most of the medicines on the WHO essential medicines list, outside of the field of HIV drugs, are not patented in the developing world, and that lack of widespread access to these medicines arise from issues fundamental to economic development – lack of infrastructure and poverty. Médecins Sans Frontières also runs a Campaign for Access to Essential Medicines campaign, which includes advocacy for greater resources to be devoted to currently untreatable diseases that primarily occur in the developing world. The Access to Medicine Index tracks how well pharmaceutical companies make their products available in the developing world. World Trade Organization negotiations in the 1990s, including the TRIPS Agreement and the Doha Declaration, have centered on issues at the intersection of international trade in pharmaceuticals and intellectual property rights, with developed world nations seeking strong intellectual property rights to protect investments made to develop new drugs, and developing world nations seeking to promote their generic pharmaceuticals industries and their ability to make medicine available to their people via compulsory licenses. Some have raised ethical objections specifically with respect to pharmaceutical patents and the high prices for drugs that they enable their proprietors to charge, which poor people in the developed world, and developing world, cannot afford. Critics also question the rationale that exclusive patent rights and the resulting high prices are required for pharmaceutical companies to recoup the large investments needed for research and development. One study concluded that marketing expenditures for new drugs often doubled the amount that was allocated for research and development. Other critics claim that patent settlements would be costly for consumers, the health care system, and state and federal governments because it would result in delaying access to lower cost generic medicines. Novartis fought a protracted battle with the government of India over the patenting of its drug, Gleevec, in India, which ended up in India's Supreme Court in a case known as Novartis v. Union of India & Others. The Supreme Court ruled narrowly against Novartis, but opponents of patenting drugs claimed it as a major victory. The environmental impact of pharmaceuticals and personal care products is controversial. PPCPs are substances used by individuals for personal health or cosmetic reasons and the products used by agribusiness to boost growth or health of livestock. PPCPs comprise a diverse collection of thousands of chemical substances, including prescription and over-the-counter therapeutic drugs, veterinary drugs, fragrances, and cosmetics. PPCPs have been detected in water bodies throughout the world and ones that persist in the environment are called Environmental Persistent Pharmaceutical Pollutants. The effects of these chemicals on humans and the environment are not yet known, but to date there is no scientific evidence that they affect human health. ^ Definition and classification of Drug or Pharmaceutical Regulatory aspects of drug approval Accessed 30 December 2013. ^ US Federal Food, Drug, and Cosmetic Act, SEC. 210., (g)(1)(B). Accessed 17 August 2008. ^ Directive 2004/27/EC of the European Parliament and of the Council of 31 March 2004 amending Directive 2001/83/EC on the Community code relating to medicinal products for human use. Article 1. Published 31 March 2004. Accessed 17 August 2008. ^ Qato DM; Wilder J; Schumm L; Gillet V; Alexander G (1 April 2016). "Changes in prescription and over-the-counter medication and dietary supplement use among older adults in the united states, 2005 vs 2011". JAMA Internal Medicine. 176 (4): 473–482. doi:10.1001/jamainternmed.2015.8581. PMC 5024734. PMID 26998708. ^ Spatz I, McGee N (25 November 2013). "Specialty Pharmaceuticals". Health Policy Briefs. Health Affairs. What's The Background?. Retrieved 28 August 2015. ^ Finkel, Richard; Cubeddu, Luigi; Clark, Michelle (2009). Lippencott's Illustrated Reviews: Pharmacology 4th Edition. Lippencott Williams & Wilkins. pp. 1–4. ISBN 978-0-7817-7155-9. ^ Anson, Blake D.; Ma, Junyi; He, Jia-Qiang (1 May 2009). "Identifying Cardiotoxic Compounds". Genetic Engineering & Biotechnology News. TechNote. 29 (9). Mary Ann Liebert. pp. 34–35. ISSN 1935-472X. OCLC 77706455. Archived from the original on 25 July 2009. Retrieved 25 July 2009. ^ Steven M. Paul; Daniel S. Mytelka; Christopher T. Dunwiddie; Charles C. Persinger; Bernard H. Munos; Stacy R. Lindborg; Aaron L. Schacht (2010). "How to improve R&D productivity: the pharmaceutical industry's grand challenge". Nature Reviews Drug Discovery. 9 (3): 203–214. doi:10.1038/nrd3078. PMID 20168317. ^ Strovel, Jeffrey; Sittampalam, Sitta; Coussens, Nathan P.; Hughes, Michael; Inglese, James; Kurtz, Andrew; Andalibi, Ali; Patton, Lavonne; Austin, Chris; Baltezor, Michael; Beckloff, Michael; Weingarten, Michael; Weir, Scott (1 July 2016). "Early Drug Discovery and Development Guidelines: For Academic Researchers, Collaborators, and Start-up Companies". Assay Guidance Manual. Eli Lilly & Company and the National Center for Advancing Translational Sciences. ^ Taylor, David (2015). The Pharmaceutical Industry and the Future of Drug Development. Issues in Environmental Science and Technology. pp. 1–33. doi:10.1039/9781782622345-00001. ISBN 978-1-78262-189-8. ^ "Medication Safety". House Findings. Retrieved 21 July 2016. ^ Dean B, Barber N, Schachter M (December 2000). "What is a prescribing error?". Qual Health Care. 9 (4): 232–7. doi:10.1136/qhc.9.4.232. PMC 1743540. PMID 11101708. ^ "PPRS: payment percentage 2017 – Details". 23 December 2016. ^ a b "Schedule 7 – International Therapeutic Class Comparison Test". 2014-04-30. ^ Fonseca, Massard da; Shadlen, Kenneth C. (April 20, 2017). "Promoting and regulating generic medicines: Brazil in comparative perspective". Revista Panamericana de Salud Pública/Pan American Journal of Public Health. 41 (e5): pg. 2. ^ S., Van Wormer, Katherine (2015-03-18). Social welfare policy for a sustainable future : the U.S. in global context. Link, Rosemary J. Los Angeles. ISBN 978-1-4522-4031-2. OCLC 899880624. ^ Kesselheim, Aaron S.; Avorn, Jerry; Sarpatwari, Ameet (23 August 2016). "The High Cost of Prescription Drugs in the United States". JAMA. 316 (8): 858–71. doi:10.1001/jama.2016.11237. PMID 27552619. ^ ""Blockbuster medicine" is defined as being one which achieves annual revenues of over US$1 billion at global level." in European Commission, Pharmaceutical Sector Inquiry, Preliminary Report (DG Competition Staff Working Paper), 28 November 2008, page 17 (pdf, 1.95 MB). ^ Whitney, Jake (February 2006). "Pharmaceutical Sales 101: Me-Too Drugs". Guernica. Archived from the original on 7 August 2008. Retrieved 31 July 2008. ^ "Pearson FT Press - InformIT". www.ftpress.com. ^ Scannell, Jack W.; Blanckley, Alex; Boldon, Helen; Warrington, Brian (2012-03-01). "Diagnosing the decline in pharmaceutical R&D efficiency". Nature Reviews Drug Discovery. 11 (3): 191–200. doi:10.1038/nrd3681. ISSN 1474-1776. PMID 22378269. ^ Stork, William (20 June 2005). "Top Pharmaceuticals: Prontosil". Chemical & Engineering News. Vol. 83 no. 25. ^ Dowling HF (June 1972). "Frustration and foundation. Management of pneumonia before antibiotics". JAMA. 220 (10): 1341–5. doi:10.1001/jama.1972.03200100053011. PMID 4553966. ^ a b c d e f Tone, Andrea and Elizabeth Watkins, Medicating Modern America: Prescription Drugs in History. New York and London, New York University, 2007. Print. ^ "Ancient Egypt: The Kahun medical papyrus". www.reshafim.org.il. ^ H.F.J. Horstmanshoff, Marten Stol, Cornelis Tilburg (2004), Magic and Rationality in Ancient Near Eastern and Graeco-Roman Medicine, p. 99, Brill Publishers, ISBN 90-04-13666-5. ^ Kenneth G. Zysk, Asceticism and Healing in Ancient India: Medicine in the Buddhist Monastery, Oxford University Press, rev. ed. (1998) ISBN 0-19-505956-5. ^ Heinrich von Staden, Herophilus: The Art of Medicine in Early Alexandria (Cambridge: Cambridge University Press, 1989), pp. 1–26. ^ Everett, Nicholas; Gabra, Martino (8 August 2014). "The pharmacology of medieval sedatives: the "Great Rest" of the Antidotarium Nicolai". Journal of Ethnopharmacology. 155 (1): 443–449. doi:10.1016/j.jep.2014.05.048. ISSN 1872-7573. PMID 24905867. ^ a b c d e f g Finkelstein S, Temin P (2008). Reasonable Rx: Solving the drug price crisis. FT Press. ^ Miller AA, Miller PF (2011). Emerging Trends in Antibacterial Discovery: Answering the Call to Arms. Caister Academic Press. ISBN 978-1-904455-89-9. ^ Helene S (2010). "EU Compassionate Use Programmes (CUPs): Regulatory Framework and Points to Consider before CUP Implementation". Pharm Med. 24 (4): 223–229. doi:10.1007/bf03256820. ^ Phillips, Lisa (4 September 2008). "Contract Law and Ethical Issues Underscore the Latest Lawsuit About Access to Experimental Drugs for Duchenne Muscular Dystrophy" (PDF). Neurology Today. 8 (17): 20–21. doi:10.1097/01.nt.0000337676.20893.50. Archived from the original (PDF) on 3 February 2014. ^ "Andrea Sloan Faces Pharma Firm With History of Indifference". Huffington Post. 26 September 2013. Retrieved 24 December 2013. ^ "In cancer drug battle, both sides appeal to ethics". CNN. 20 September 2013. Retrieved 24 December 2013. ^ "The Selection and Use of Essential Medicines – WHO Technical Report Series, No. 914: 4. Other outstanding technical issues: 4.2 Description of essential medicines". Apps.who.int. 14 April 2016. Retrieved 25 June 2016. ^ a b Banta D.H. (2001). "Worldwide Interest in Global Access to Drugs". Journal of the American Medical Association. 285 (22): 2844–46. doi:10.1001/jama.285.22.2844. PMID 11401589. ^ Ferreira L (2002). "Access to Affordable HIV/AIDS Drugs: The Human Rights Obligations of Multinational Pharmaceutical Corporations". Fordham Law Review. 71 (3): 1133–79. PMID 12523370. ^ Barton J.H. ; Emanuel E.J. (2005). "The Patents-Based Pharmaceutical Development Process: Rationale, Problems and Potential Reforms". Journal of the American Medical Association. 294 (16): 2075–82. doi:10.1001/jama.294.16.2075. PMID 16249422. ^ "Misguided Policy on Patents". Generic Pharmaceutical Association (GPhA). Retrieved 8 October 2015. ^ U.S. EPA. Pharmaceuticals and Personal Care Products. Accessed 16 March 2009. Wikivoyage has a travel guide for Medication. Wikimedia Commons has media related to Pharmaceutical drugs.